I may just be one of the last few people on this planet, especially among Indians, who is reading this book now. I usually don’t pick up books that are causing the current wave of hysteria. I tend to go with great expectations and a very critical pair of eyes, so I have learned it’s best to wait for the hype to subside before curiosity eventually leads me to the book. With The Namesake, there is an additional reason why I consciously stayed away from both the book and the movie. I went through this phase of aversion until last year regarding all topics related to immigration woes, the culture shock and the rift between the first and second generation immigrants. Wherever I turned within family or friends, I saw this topic being beaten to death with the innumerable (often closed-minded) discussions and vociferous arguments. Yes, I understand the crux of the issue, but I resent the exaggerated perspectives of both sides of the argument. I also get tired of the stereotypical portraits that are repeatedly perpetuated in movies and books - they seem to turn the issue into a satire, and a mockery. Anyway, I eventually drifted to the book to see what the fuss is all about. The synopsis is probably all too familiar. Gogol Ganguli is a second generation Indian American, born to traditional Bengali parents. His father is the quintessential Indian academic - a professor of Electrical Engineering, and his mother is the perennially home-sick and lost stay-at-home wife and mother. Starting from his name, everything about his culture, his family and his roots are unfathomable to Gogol. The story is about Gogol’s tussle to break-free of his stringent family and how he gradually learns his way through his heritage and comes to identify with his roots. 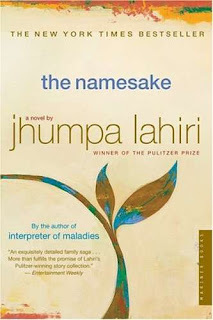 It was heartening that Jhumpa Lahiri did not stereotype the characters. She manages to bring out the very subtle aspects of being an Indian family and how drastically different those aspects are in contrast to the Western families. And I appreciated the fact that she made the distinction between which of these aspects are endearing and make us unique, and which aspects are not necessarily healthy to keep practicing down the generations. In most movies, the stark differences are either shown as acute embarrassments or glorified to unnecessary heights, and I hate either approach. It was also a refreshing relief to me that the culture battles didn’t take centre stage and dominate the book. The core of the book is on one’s search for identity. Lahiri dwells on how the second generation leads bitter and confused lives because of their ceaseless need to rebel almost all through their life, even when their parents no longer present the stifling circumstances for it. The constant subconscious pressure to seek the forbidden and make a statement is shown to take precedence over leading a normal life. She shows that the search for one’s identity intensifies, especially after they break-free from their family. However, there is one aspect of the first generation immigrants that I never fully comprehend or empathize with. True, living in a country that in no way resembles home is daunting. And I can imagine how acute it must have been in the 70s and 80s when there was no technology to help us stay connected with family, hardly any Indian stores or restaurants to resort to authentic dishes etc. But the class of highly qualified professionals have a very clear choice - they don’t have to suffer the misery and can go back home. Lahiri calls these people brave and courageous to continue to stay away from home and make a living abroad. I definitely don’t agree with the adjectives, “brave”, or “courageous” , or to even call it a sacrifice! All of us make a clear, deliberate, conscious decision between the two choices - return home or live abroad. A professor of Electrical Engineering can lead a very comfortable life in India, but if he chooses to stay in a country that helps him advance in his career much better and promises a greater standard of living for his family, then his choice doesn’t stem out of anything noble or brave! We all make this choice time and again to fulfill our selfish goals. We choose to compromise, and according to me, when the compromise turns into an unbearable sacrifice, then nobody is stopping us from making the move. But to put on a facade of constant suffering and sacrifice to live in this country with the implication that they are somehow tied to the place out of no other choice, is unfair. It’s not like we are refugees who can’t return to our own country, or our country is so impoverished or war-torn and filled with political conflict that we can’t set up a secure home. There are many immigrants who are unfortunately driven away from their countries - I sympathize with them, not with those of us who are assured a decent life in either countries. And that is why I don’t like the drama surrounding the Indian Diaspora's “dilemma”. Those who complain the most and talk of being home-sick all the time, are the first ones to wonder if they will be able to cope with the traffic and cows on the road if they are to go back. It’s hypocritical. I also resent the fact that even after spending two decades in a country away from home, some immigrants still refuse to see the place as their home (away from home) or mingle with people other than one’s own nationality or community. Pockets of Indians, no matter how long they have lived here, continue to mix and mingle only with each other. If we decide to isolate ourselves from a community we choose to live in and which is clearly helping us reach our ambitions, then we can’t complain of being treated as aliens. Anyway, that’s my rambling two cents on the issue. The compromises are clear, but I see us making the same choices and mistakes over and over again, and then complaining about them. Also, the false, rosy expectations of second generation children never seem to change. Digested thoughts: Rerouting my derailed thoughts back to the book, I definitely found it an interesting read. I appreciated that Lahiri explored much subtler and deeper issues about the clash between first and second generation Indian Americans. Her characters were realistically drawn out and were not stereotypical caricatures. Her writing was simple; it was mostly insightful, but sometimes I found her sentences to be stilted in their construction. In all, I would give it a favorable rating. My initial impressions of the book were not that great. I basically was a little annoyed with Lahiri's fascination with needless complications in her characters and also felt her world had to "grow" out of the Indian (and let's be specific), "Bengali" immigrant family world- cause all her books seem to be based on just this one theme. This is the only instance where I watched the movie and the movie made me appreciate the book better! I.e., the story better... No matter how many times I watch it, I find the movie really poignant. Tabu is fantastic in the movie. The movie made me appreciate certain finer aspects of the personae in the story. I felt when I read the book that the language wasn't as beautiful as in her short stories in the 'Interpreter of Maladies' collection, and that probably had a significant part to play in my reactions to the book. I agree with your thought that there is nothing noble or sacrificial about being away from one's home, and that being cocooned in a community just because your DNA is related is not healthy, and more importantly, not FUN :-). I agree with you 100%. When we move abroad we have made a clear decision for own selfish reasons. I have been through the phase (first year in US) where I complained about everything- no indian food, no indian festivals, no family around blah blah, But as I lived here I realised what this country offers and the fact that America is really made of the people who come here. Unlike so many other countries it truly belong to anyone who wants to make it theirs. Today I can easily call it home. I have learnt to appreciate what it offers and won't say its courageous in any way to stay here, its simply a choice made willingly. Lovely post as always. Actually you are not the last person! I'm probably the last one:-) I've been 'planning' for yeas to read 'the namesake' and the 'the kiterunner', and hopefully will get to them soon. I fully agree with your view that in the end everything is a choice. If people choose to stay back in the US, its simply because at some level, maybe subconscious, they find it superior to staying in India. But I've read Lahiri's 'Unaccustomed earth', and found the settings for all her stories to be practically identical. Sumi, no worries about spamming! Love to hear your thoughts :).This is my first Lahiri read, and as I mentioned, I avoided picking up her books for the precise reason that they all seemed to be based on the same issue. I agree, I didn't find the writing in this book to be striking or beautiful. Maybe I should watch the movie! But I did welcome her layered complicated characters, for I seem to have had an overdose of stereotypes and craved for something different. That said, I didn't necessarily like Moushumi's character development. I agree that there is no inherent hypocrisy to the dilemma itself, but from my personal experiences, the vast majority seems to have an obsession to multiply their cultural/religious ties on coming here (probably to hang on to their identities) and who refuse to acclimatize to the place and endlessly complain, however when it comes to a discussion of going back, they offer cows and traffic as reasons, which to me is ironical and hypocritical to some degree. However, I know there is a substantial group which is quite comfortable here, but who struggle to choose between their priorities - such as being near parents/family or wanting a better standard of life/career opportunities. It's a genuine situation, but I still don't think it merits the amount of attention and hype it receives. I guess I have oversimplified the dilemma in my mind. No place is perfect and it has its share of discomforts. I made my share of compromises when I came here, and since my priority was in focus, I could overlook those discomforts and adapt. Similarly, I am aware that my priorities towards my family will take precedence in some time, and I see my compromise as trying to adapt back to certain day-day inconveniences back home. I can see the little inconveniences being overruled by my priority of being close to parents. But I understand it's a protracted struggle if one can't see that happening... However, I also feel that most often one is missing the forest for the trees, and gets stuck. Perception - Thanks! I still do get homesick every now and then, but I agree that it's up to us to make a home here. Karthik - I haven't read Kiterunner either! But I feel like I have already read the book just by hearing others' rave reviews! I am curious to read Interpreter of Maladies, but I don't think I'll read other books by her until she starts writing about something else. Rafiki - Thank you! I can imagine how this book would have affected you when you were homesick. And yes, I liked her character development too. As someone who is often homesick for the strangest things (like the fact that the smell of rain is different here) I think I sympathize a little more with characters, either fictional or real, who complain about missing 'home'. Of course, there are limits to the laments one can put up with. The book itself- I got started on her books much before the hype (thankfully). And Interpreter of Maladies was by far the most creative thing she wrote. The rest are just spin-offs, and Un. Earth is the worst. Namesake is one of those books where the movie is a big improvement, I think.